Last Chance To See Crime Scene Insects! The exhibit closes January 17. 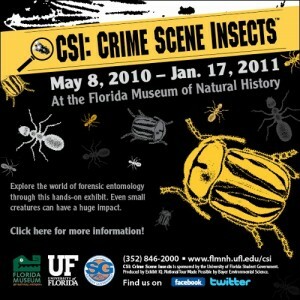 The Florida Museum of Natural History’s creepy/fun exhibit “Crime Scene Insects” is closing January 17. 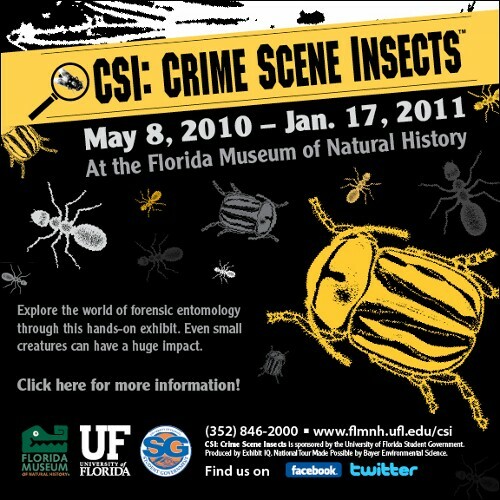 Don’t miss a trip to the Gainesville museum to see this ghoulishly fascinating look into how insects tell the story of a crime’s where, when and how to help investigators catch the guilty party. Warning: this exhibit is seriously gross, and not for the squeamish or little kids. If you have either of those in your party, don’t worry — they’ll find plenty to do at the museum while you tour the CSI exhibit. (Little kids especially love the cave and the Calusa chief’s straw hut. Admission is $6.50 for adults, $6 for Florida residents, $5.50 for seniors and Florida College Students, and $4 for kids ages 3-12. Museum members, kids 2 and under and UF students are free.